I hate the fax machine. I would much prefer sending something via email. For some reason unknown to me we are stuck with the fax for the time being. I think within the next 30 years it will be obsolete. The problem is, unless you have a fax machine at home you may have to go to staples or office max and pay some outrageous price to fax a few pages. To hopefully avoid that, here are a few of the cheapest ways to send a fax online. 2.) Everyone else. These other options might be better if you need a personal fax number or need to receive faxes. eFax - $15/month. They do have a free version that lets you receive up to 10 faxes per month. 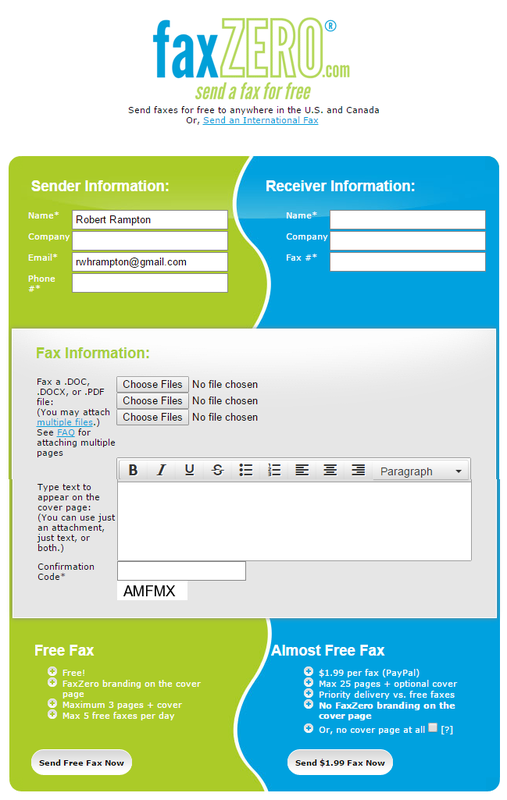 k7 - is free for incoming and outgoing faxes. But you have to send/receive a fax every 30 days or your account will be deleted. There are a lot of other online fax companies that I didn't cover. If you find a good one feel free to post about it below. UPDATE: This deal has ended. Subscribe to newsleter to get updates on future offers. This is the promotion: Spend at least $10 at Newegg.com with "American Express Checkout" and you'll get a $10 statement credit. So you can spend more than $10, but the best deal is to just purchase an e-gift card to a place you might go to in the future. 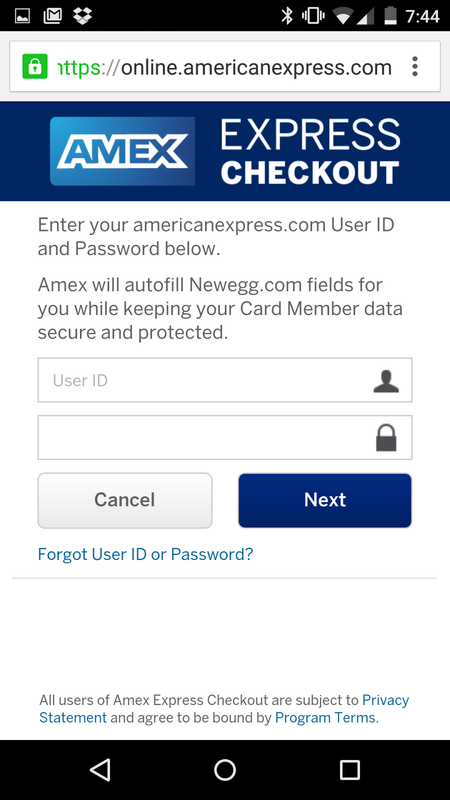 NO NEED to register your card...just make sure you use American Express Checkout and you'll get the credit. Too easy! NOTE: This are several other merchants that you can get a $10 credit, but Newegg is the only one that really makes sense to me. 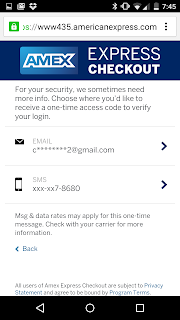 You can get the $10 credit on all of your consumer and business AMEX cards...even authorized users. If you have multiple cards you want to get the free deal on (I have over 10), then I found that making the purchases with the Newegg App on your smart phone is the easiest way to do it (there are errors that occur when I tried doing on my laptop). 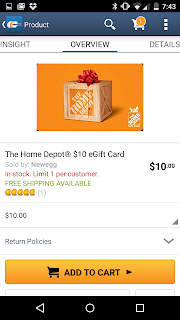 You can only get ONE $10 gift card per vender in a 48 hour period per Newegg account. 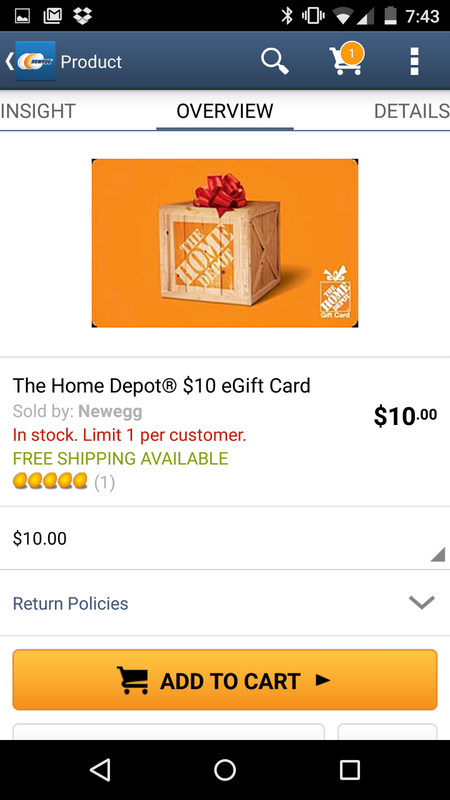 So if you wanted 2 $10 home depot gift cards by using 2 different AMEX cards, you would have to wait 48 hours before purchasing the 2nd $10 home depot gift card. You will see the shopping cart in the upper right corner have an item. Click on that to checkout. This is the important part. DON'T click on "Secure Checkout". 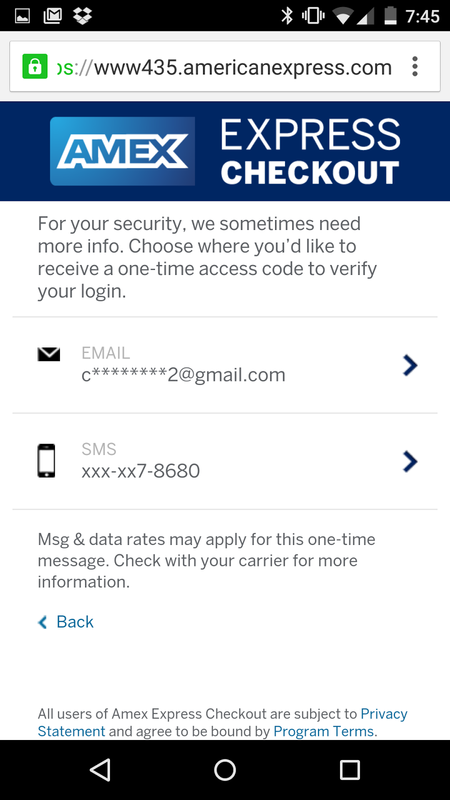 Select "AMEX Express Checkout"
You will then be asked to sign into your american express account. Select the card you want to use. You will then be sent a code that will be used to verify the transaction. And then you will be asked to complete the order. 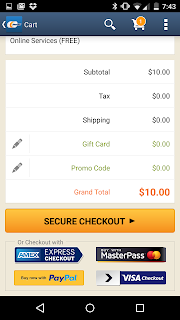 It's very easy to do and definitely worth the few minutes to get some free $10 e-gift cards. You don't even need to pull out your credit card to do this which is really nice. 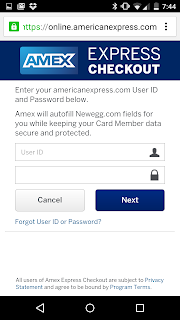 Don't have an AMEX credit card or want to get some more? 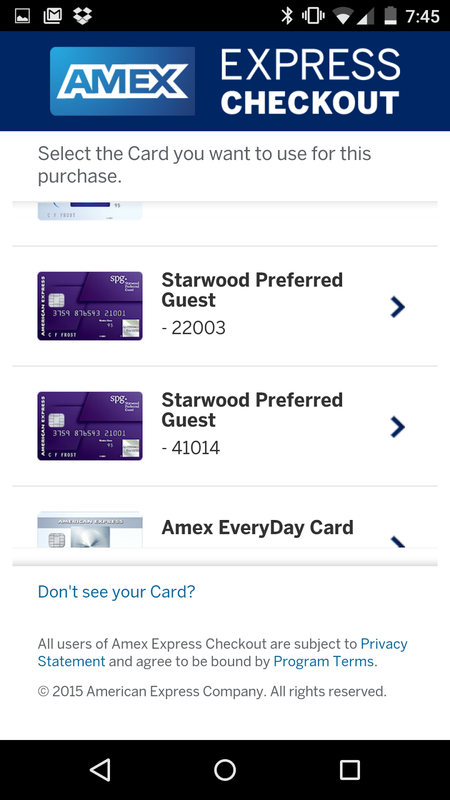 I would recommend getting the SPG AMEX credit card as the bonus is temporarily increased to 30,000 points, which is a a good offer. You can use that to book 3-10 hotel nights or you could cash it out for $300-$500 in cash. Not sure how you will spend enough to get the bonus? This is a good starting point to help you figure it out>. Another thing you could do is add an authorized user to your current account and you'll get another card in the mail in a week or so. I've added myself to all of my wife's accounts and her to all of my accounts. Small Business Saturday is coming up in November, so this is a good time to collect a few more AMEX credit cards. UPDATE: I am no longer able to make purchases via giftcards.com. Orders keep getting canceled by them. Their customer service is terrible giving to reasons for the problem. Maybe you will have success though, in which case, this is a great option for you. The methods of how to manufactured spend are always changing. That's why it's important to read blogs like this one if you want to stay up-to-date on ways to earn miles/points, and get big credit card bonuses. Disclaimer: As always, you have to be very careful with credit cards! A couple of months ago, I got approved for the AMEX Business Platinum card. The card came with an offer to get 150k MR points after spending $20,000 within 3 months. My total expenses right now are about $3,500/month, so of course, there is no way I could normally spend that much. That's where manufactured spending comes into play! 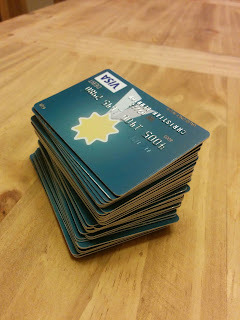 I bought $20,000 worth of Visa Gift cards on Giftcards.com. I actually bought 40 $500 visa gift cards in separate orders of $1,500 per order. Why $1,500 orders? Because there is a free first class shipping promo code that will work on orders up to $1,500. So this made the shipping free! The promo code that I used is FREEUSPS915. This code is good until the end of the year, can be used multiple times, and it can be used by anyone. 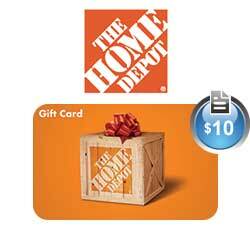 You can get the visa gift cards in increments of $25-$500. It makes the most sense to get the $500 amount as there is a fee associated with getting these cards of $4.95 and it is the same for all gift card amounts. So the cool thing about Giftcards.com is that they have a rewards program where you earn "G Money" for all your purchases (make sure you sign up for it). 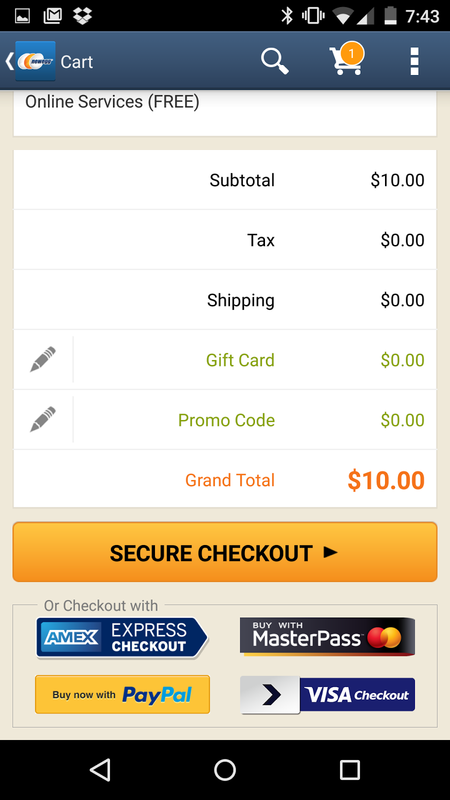 You get one point for every dollar spent and you can redeem the points on any future orders. So, that's basically 1% cash back. This cancels out the visa gift card fee, so in the end you are buying these visa gift cards with no shipping fee (above promo code) and you earn back the gift card fee with their rewards program. Plus, of course, you'll get your credit card rewards points. So, if you use a credit card that gives 2% cash back you'll be making $10 per $500. Maybe it's worth buying these visa gift cards just to earn credit card points/miles, but it's especially useful to help meet spending requirements to get credit card bonuses...like in my case...spending $20,000. Note: it would be a good idea to not purchase too many gift cards at a time as you credit card company might freeze you account until you talk to them on the phone (not a problem, but it can just be a hassle). Start small and spead it out through the month. What do you do when you get the gift cards in the mail? Okay, so you get the gift cards in the mail and you activate them and write down the pin number (or I like to set my own pin number to be the same for all the cards). There are very few things that we need in more occasions during the year than flowers. We use them for birthdays, for mother’s day, we give them to our girlfriends, our wives, our mothers and also to celebrate special occasion or pay tribute to someone who might have passed away. In this article we are going to give you the best options you can find online in order to be able to buy flowers all year long for the most affordable cost possible. This place delivers to 184 countries and over 12279 cities in the world. The best thing is that you will never find a cheaper option that allows you to order from so many different locations and get your flowers as fast as possible. They also have great discounts for orders that go above a certain cost and this is the reason why we recommend this particular site as your first option. This place is particularly good because they offer very good looking flower selections for a very low cost. They have bouquets, baskets and a large number of customizable options that will be ideal depending on your needs. Just input a zip code and a delivery date and you will get the best results to match your needs. 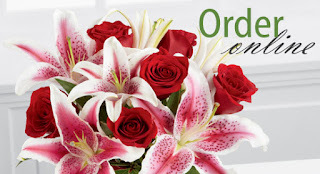 There is no other place quite like sendflowers.com because at first glance they seem like an expensive business, but they have all kinds of selections that can range from extremely affordable, to very expensive and elegant flower arrangements. All of the sites that we have provided to you right now are going to be great choices for your needs, but you should check all of them out in order to see which one has the kind of floral arrangements that will be most useful for what you require at the moment. 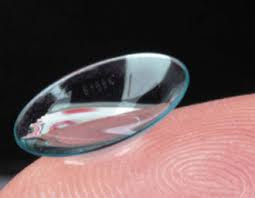 You can be sure that these are places where you can safely purchase anything without worries. Being able to move around freely while you are on vacations is going to be essential if you want to enjoy every minute. The good things is that now with GPS technology being so readily available to anyone, here is no question that people are going to how more interest in being able to drive around and not fear getting lost and wasting hours of their day trying to find paces. For this reason, we have decided to come up with a list of the cheapest online sites to rent a car in any locations of the world. This search will only provide results from independent agencies and it will not show you result coming from the large rentals. There are over 300 agencies in their search results and they all have very affordable prices, so it’s definitely ideal. This place is without a doubt one of the greatest choices you can consider. All you need to do is select a specific location, by city or zip code and the pickup and drop off date. Once you input that, you will be able to get a large number of results based on prices, distance, vehicle models and location. 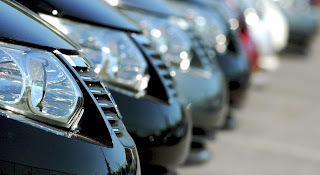 They have a very robust database that will display the vehicles based on rates and this gives you a chance to narrow your search to the most affordable available models. All of these websites have plenty of options to choose from and they are all quite reliable too. You can expect a good service that will allow you to get the most out of your car rental experience and that is what truly matters.